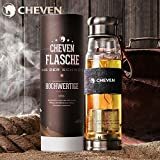 CHEVEN Tea Tumbler & Water bottle is an ideal choice for Tea, Coffee and Fruit Drink. Product Feature: Healthy Material- The crystal grade glass is BPA free and lead free. No peculiar smell. High Quality-Ultra clear borosilicate glass design is sturdy. Easy to Clean-Two openings and food grade stainless steel lids are easy for cleaning and drying. Versatile Use- Use as a traditional tea tumbler, coffee infuser and as a fruit water infuser.Product Description: Brand: CHEVEN Material: Borosilicate Glass Size: 20 Ounces Dimension: 2.8 inches x 2.8 inches x 9.6 inches Package included:* Bottle with lid* Stylish Denim Insulated Thermo Sleeve* Artificial Leather Strap* Travel Insulated Thermo and heat preservation SleeveUsing Instructions:1.Remove the bottom lid and lightly push the infuser into the bottle until it snaps in place.2.Fill the infuser with your admired type of loose tea or tea bag and place the bottom lid back on the bottle.3.Remove the top lid and pour water from the bottle top.4.Place the top lid back on the bottle and watch your tea steep to perfection. Designed for every day use, the strainer may not work with the very fine tea leaves or tea leaf powder. Evosa presents our dual glass 14-16oz tea tumbler and fruit infuser. The superlative addition to any healthy minded lifestyle, our tea tumbler fruit infuser and coffee maker is BPA free and constructed of thermal shock proof borosilicate glass and organic bamboo. 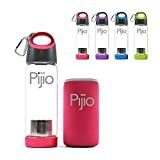 Perfect for home brewing teas, coffee, or delicious fruit or vegetable infused waters and sparkling waters. 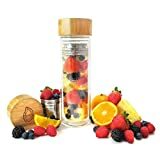 Whether you're trying to live a healthier lifestyle, undergoing a refreshing detox, or just enjoy your coffee and tea at their maximum freshness our tea tumbler fruit infuser is for you. And because you are buying from Evosa it comes to you with our 100% customer satisfaction guarantee. Enjoy your popular beverages with these beautifully-crafted tumblers by Francois et Mimi. The new 16oz Fish Tea Traveler has all the same awesome original features; BPA Free materials are enhanced with leak proof technology that is easy to use and easy to clean. The larger 16 ounce capacity is perfectly sized to fit the rapidly growing North American tea market's desire for more tea on-the-go. 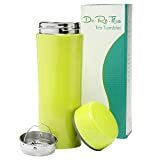 Stainless Steel Tea Tumbler with Strainer Look Stylish while drinking tea on-the-go with this easy-to-carry travel tea mug! 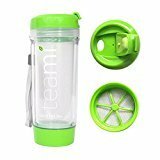 - Do you want a durable and high-quality tea tumbler that will keep your liquids hot or cold for hours? - Do you want a no-mess, worry-free way to bring your beverage along with you to school, to the office or to your admired activities? - Do you want to look stylish while drinking from your tea travel mug? We think you'll agree that the Do-Re-Tea Stainless Steel Tea Tumbler is exactly what you're looking for! 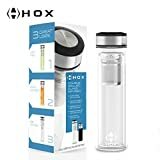 - Constructed in food-grade 18/8 stainless steel, double-walled and vacuum-insulated, this tea tumbler will keep your liquids hot or cold for at least 6 hours. - Completely leakproof with a handy tea filter - use it to keep tea leaves out of every sip! Also has a non-slip material on the bottom of the bottle - no tipping over, no spills! - Sleek, slim and contoured design in a fun, vibrant color makes this travel mug stylish! It may become your beloved tea accessory! Happy customers make us happy. We trust our Brand to be a Premium Quality Product. And we are confident that you will, too! Click Buy Now to find out!